I usually have two pieces of Dove chocolate each day after my lunch, to balance out whatever healthy item I just ate. I like the taste of milk chocolate, and Dove is particularly creamy and smooth. I also like to read the little message inside each wrapper. Sometimes the advice is humorous, such as when my chocolate tells me to take a walk on the wild side(my wild side is in bed by 9pm). Occasionally the message seems tailor made for me, such as every time I open the wrapper and see the words "Take a nap." (They frown upon naps at work, but I have a couch, and it's very comfy and tempting!) It's like a little note in my lunch from the Cosmos instead of my mom, except my mom wouldn't ever send me chocolate in my lunch because she was watching my weight. But the message today, well, it was downright interesting. 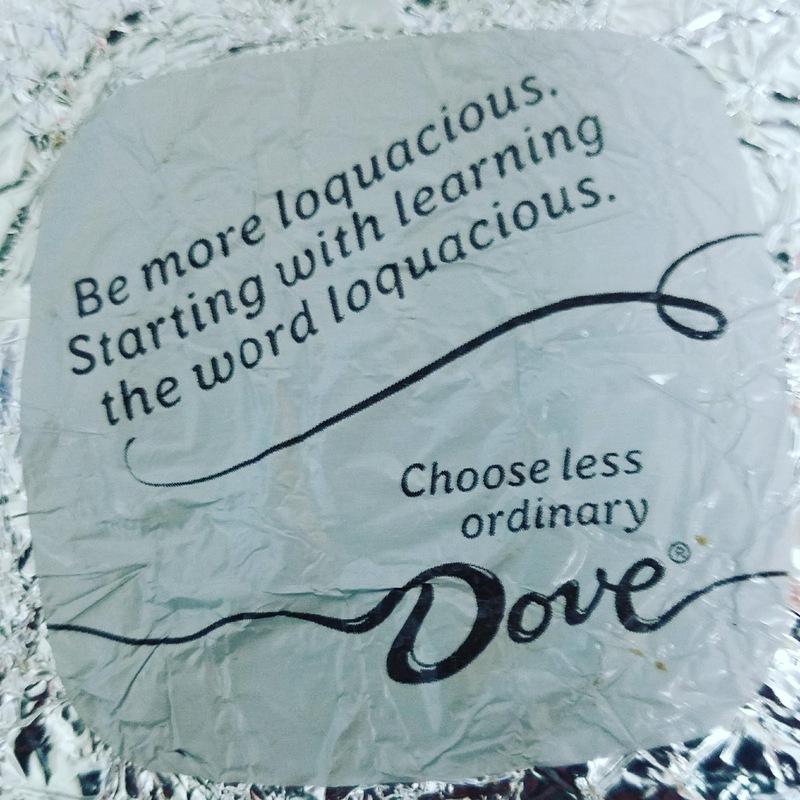 Be more loquacious. I always give mental bonus points when I read or hear a word that is not typically used in every day conversation. Blame all of my English teachers over the years who gave extra credit for using vocabulary words correctly in a sentence. I love the word loquacious. It is a sassy word, filling your mouth and rolling off the tongue. It sounds smart, and just a little bit irreverent at the same time. A secret joke that nobody else gets, a message just for you. Or a good joke between best friends sitting at a table in a cafe, causing one friend to roll their eyes while the other leans closer, giggling. But then Dove went just a little further. They encourage the reader to learn a new word, to add it to their vocabulary. 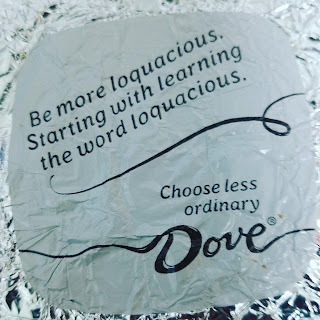 Because loquacious is not an ordinary word. It is an extraordinary word, full of possibilities. I like that. What I might possibly be loquacious about today? I had to look loquacious up. Dove knows what their market likes. HaHa.